Mary McIvor of Shoreside Dunbeath died 30th August 1965 aged 89. Keneth McIvor Portormin Road Dunbeath died 10th April 1978 aged 67. 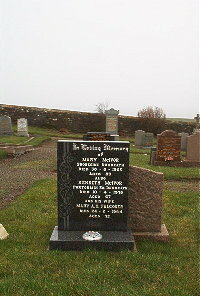 Wife Mary A G Falconer died 24th February 1994 aged 75.